Lori Barker’s mixed media work blends nature and spirituality into an exploration of the rhythms of life. Angels, in particular, inspire her and are Lori’s trusted muse. The work is about the poetry that lives beneath the surface of things where layers of paper, paint, wood, fabric, metal and images come alive creating an altered world. The artist’s life isn’t about taking it easy and making art whenever you want to. Hard work is required, and for that you must be devoted. Lori has devoted 45 years developing, learning and teaching techniques. Lori is a former teacher and graduate of Southern Conn. St. University; with further studies at Savannah College of Art and Design, Bennington College and Omega Institute. Solo exhibits in Connecticut include: Monastery Gallery West Hartford, Unitarian Meeting House Hartford, Miranda Winery, Jerrum Winery, The UCONN Library, Norfolk Artisan's Gallery, Atelier Gallery in New Milford, Church House Concerts, Haddam, the Gathering Place, Hartford, and New Milford, Torrington, and Waterbury Hospitals, St. Mary’s Hospital in Waterbury and numerous libraries including the Lucy Robbins in Newington, New Milford Library, Oliver Wolcott Library in Litchfield and the Hunt Library in Falls Village. Lori’s one-woman shows in other states include the Santarella Museum in Tyringham, MA, and the Smith Gallery in Manchester, VT.
She was an Artist in residence at Santarella Museum in Tyringham, MA. Lori was featured in magazines including the Crafts Report , Artitude, Artella and on the covers of Reiki One and The Door Opener. 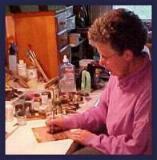 She exhibits her work in art and craft fairs throughout the year. Lori won Best in Show and other prizes at numerous galleries and art events throughout New England including the Essex Art Association, the Norwich Arts, Milford Fine Arts show, Hillsdale festival, New Milford Fine Arts show, Hartford Riverfest, and Danbury Arts Fest. In June 2009, she was awarded the Museum of Contemporary Impressionism's award for excellence. In 2012, Lori and her husband opened the Artists’ Path Gallery in Bantam, CT. where they showed over 40 artisans’ work and won Yankee Magazine’s Best Small Gallery in CT. The gallery closed Dec. 31, 2015. Lori lives with her husband, Ernie Barker, in Goshen, CT where they have established a charming gallery and sculptural grounds. The Touch House (a straw bale construction building), Labyrinth and Purple Door gallery are open to the public by appointment or by chance.